My copy does not have a dust jacket, but this photo is from an eBay listing by seller departedbooks. It is two years into the French Revolution. Lt. Hector Fotheringay of the British Third Guards leads an idle life in England. He is in love with Lady Betty Marchmont, but there is a problem. He has lots of debts and only a small annual allowance of £200. Under the terms of his late father's will, he will come into his inheritance only when he marries, so he needs a wife. One night in a tavern, he hears Betty's name being bantered about, and promptly throws his drink into the man's face, not recognizing him as the Prince of Wales - an unheard of affront. His military career is immediately in jeopardy as he is arrested. A Mr. Gray offers him a deal: if he will perform a secret mission in France, Mr. Gray can get his action forgiven. Fotheringay accepts. As he is fluent in French, he is told to impersonate a French citizen, Jean-François Charpentier and meet with a certain Engstrom in Paris. Hector travels to Paris, where the revolutionaries are in charge and the aristocrats are being sent to the guillotine every day. He passes the inspection of Citizen Commissary Grand-Duc, (a hunchback). He then finds Engstrom has already been executed. Wearing the distinctive tricolor cockade ribbon to show his [assumed] allegiance, he takes a position as a spy for the disabled revolutionary Citizen Couthon, During his search for his contact, he meets and falls in love (#2) with a young Parisian girl, Loison Mallet. Charpentier is under constant suspicion as a fake by Grand-Duc, who sends for Citoyenne Regnault, the mistress of the real Jean-François Charpentier, and asks her to either identify or expose him. But to his surprise, she claims he is the real Jean-François Charpentier; and whisks him away to her villa where he falls in love with her (#3). 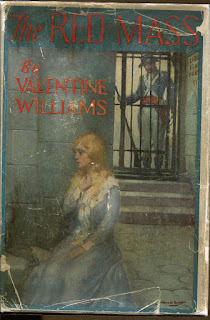 Having read about a dozen of Valentine Williams' books, I expected this to be his usual murder mystery set in the period following WWI. I was quite wrong. This book was a complete and exciting surprise. If you enjoyed Les Misérables, you will love this book. It features many of the same themes: assumed identities in Paris during the period of the French Revolution, love interest in a poor Parisian woman, and political skullduggery. Just listen to the opening of Chapter X. Can you hear the people sing? There are moments in the life of every man when the clamour of the world is stilled, and in the brief ensuing silence he seems to hear the pendulum of eternity ticking away the hours of his allotted span. In these rare interludes a man may see himself scaled down to his true proportions in the scheme of things, and realise, though but dimly, that all around him, from the cradle to the grave, immense, unfathomed forces are directing the current of his life. A basic knowledge of French is helpful to follow this book, as occasional passages are rendered in that language. Do you have this book? One page is missing in mine! I do not have page 3/4, so I may be missing the very beginning of the story! The first sentence I have (on p.5) is "May was approaching its close." If you have a previous page of text, would you be kind enough to photograph/copy it, and send it to me? If you have the Kindle version you may be able to copy/paste.